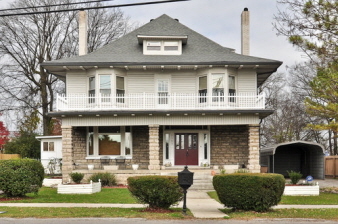 The American Foursquare, or the Prairie Box, was a post-Victorian style that shared many features with the Prairie architecture pioneered by Frank Lloyd Wright. The boxy foursquare shape provided roomy interiors for homes on small city lots. The simple, square shape also made the Foursquare style especially practical for mail order house kits from Sears and other catalog companies.